You have probably heard the joke about professional development: “Dear Lord, please let me die at a staff development workshop. The difference between being alive and being dead is so indiscernible that I probably won’t even notice I’ve died.” In fact, my dear former colleague Barbara Rosenblit at the Weber School in Atlanta recently quoted the joke as well in her article for Ravsak, “Inverting the Triangle: Reimagining this So-Called Profession.” Barbara says in her article that “we regularly infantilize teachers with what we offer as educational opportunities.” She doesn’t explicitly say so in her article, but having worked with Barbara for eight years, I feel confident in saying that one of the big problems she has with professional development is that teachers have no choice about what kind of professional development is on offer. They are not supported to go to conferences of their own choosing. They are not offered opportunities to design their own learning experiences. Professional development days are dreaded as long, boring days in which we are talked at and perhaps made to watch excruciatingly bad PowerPoints. When my Dean of Faculty offered us the opportunity to be on a Vision Steering Committee tasked with working with the administration and the faculty to help articulate and build a shared vision for the school as well as help guide our school culture toward that vision, I jumped at the chance. The way I see it, it is important for teachers to step up when they are given opportunities to have their voices heard in this way. Teachers have a stake in the vision for their school, but they’re not always asked to share their ideas for that vision. The trouble as I see it with widespread adoption of the unconference model is that it involves a great deal of trust in the faculty. 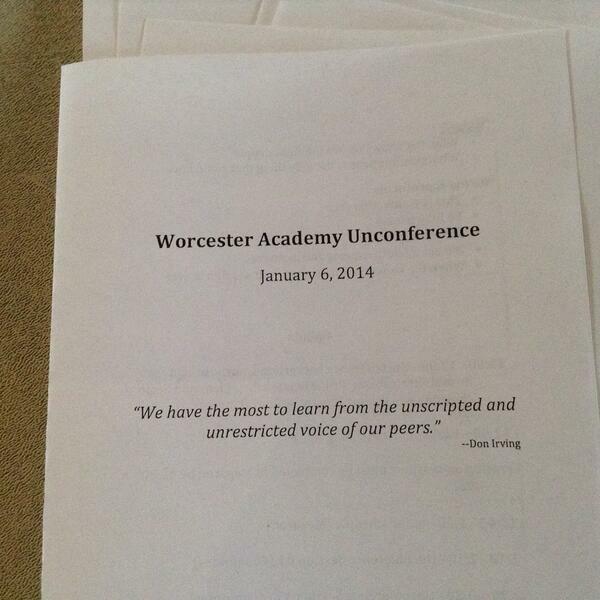 It takes a courageous administration to trust the faculty to pull off an unconference. However, I think the time has come for administrators to trust their faculties. There is a lot of angst in the air among educators right now, and the core of the problem lies in feeling we are not to be trusted. Planning professional development is only a small part of it, and Barbara articulates more of the problems in the article I linked above. We used a Google Doc to plan and talk about how the day would take shape. In the end, we settled on two one-hour unconference sessions, and because this is new to our faculty, we invited them to propose ideas for sessions in a Google Doc before the PD day itself. First, a few of us shared our experiences with unconferences as a means of explaining what they are to our colleagues. Next, a few of us discussed norms for participation in an unconference. Then it was time for the planning to begin. We divided into tables with about eight people at each table, and we had a three-minute idea dump. We wrote ideas on sticky notes. 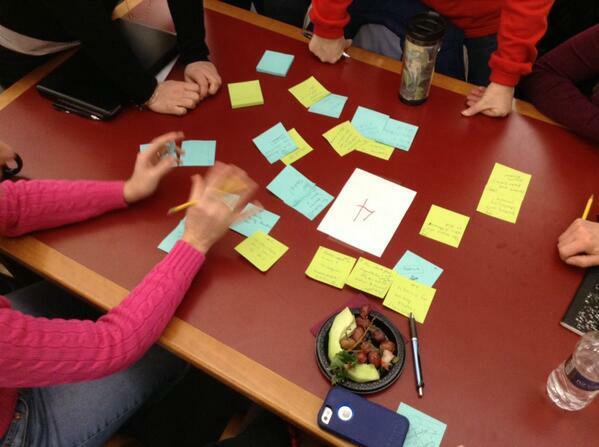 After the idea dump, we voted on the ideas and selected two from each table to present to the faculty as a whole. I know my table decided to put checkmarks on the ideas we liked, and we tallied the checks and chose the top two. These ideas were added to large pieces of chart paper along with the ideas already shared on the Google Doc and placed in a large room where we could further narrow down the topics after lunch. We elected to supply sticky notes, and teachers attached sticky notes to the topics that interested them most. How can the schedule best facilitate learning? I attended the sessions on Project-Based Learning and Portfolios as Authentic Assessment. I thought it was the best professional development day I ever had. I had an opportunity to talk about issues I care about with peers who care about the same things. 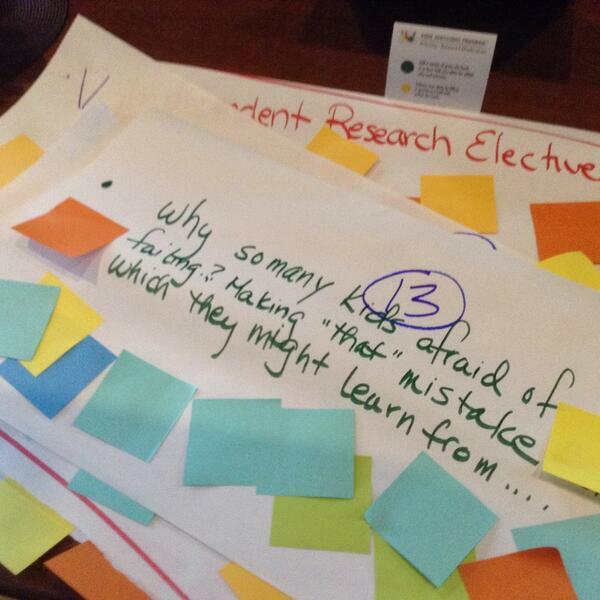 We talked about what was happening in our classrooms and how we envisioned carrying the ideas further. For instance, one of our science teachers described a project he designed with a colleague for physics in which students spent just about the entire trimester building their own cars. They learned the principles of physics in the process, but the learning became more relevant and important when it moved from the theoretical to the practical. He described a point at which he realized all the student groups were having the same problem with acceleration and gave direct instruction about the issue. They didn’t have to memorize information about acceleration. They had to understand it and apply it to their car design. He also shared candidly that there was a point when he thought it would be a disaster and that the students wouldn’t pull it off, and he wouldn’t pull it off—the students were frustrated, and he was frustrated. They pushed past it, and in the end, he said most of the students felt it had a great deal of value. The learning all branched out the project. The issues that arose over the course of the project became the focus of lessons and quizzes. He mentioned that some topics he covered might not have been explored until much later in the year, but because they became important to learn because of the project, the students explored these topics earlier. I loved hearing about what was happening in his classroom. The feedback I have heard so far is that faculty enjoyed the opportunity to choose what they wanted to learn more about and to cross departments and divisions (we have a middle school and upper school) to talk about what they wanted to learn. I can’t remember ever leaving at the end of a PD day feeling energized and wanting to get in my classroom as soon as possible. That is a really sad statement, if you think about it. Conferences? Sure. I almost always leave conferences excited to go back to my classroom with what I’ve learned. However, I left this particular PD day excited about going into my classroom the next day and thinking about the discussions I had with my colleagues. Some things we might do differently? I think in our haste to honor topics that received the most votes, we let some really good and important topics slide. Some of the topics we explored wound up not really being about professional development so much as discussion of policy. Perhaps that is fine, but not everyone walked away feeling like I did after my two excellent sessions as a result. It is easy to let such sessions devolve into venting frustration. While it is validating to hear others voice your own concerns, it isn’t very energizing. Teachers need to be trusted to care about and design their own learning experiences. The unconference model offers schools a great opportunity to put professional development in the hands of their teachers. Perfect timing….we just did same thing at Loomis Chaffee for fac day on 1/6/2014. Here is my post event blog post…reads the same as yours in many ways!